The Garhwali Inn offers spell binding view of Himalayan ranges in the North and of eyes refreshing lush green mountains overlooking Jim Corbett forest, Kalagarh Dam and river Kho in the South. Revitalize in pollution free environment in the lap of Himalayan mountains in the Garhwali Inn hotel. What Gahrwali Inn Resort offers? 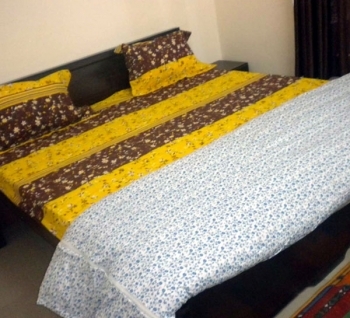 - We offer spacious, well furnished rooms and truly Garhwali hospitality and delicious 100% organic Garhwali cuisine besides Indian, Chinese and continental delicacies. - Experienced guides for long as well as short trekking. - Picnic trips to numerous locations in the hills and along rivers Madhu Ganga and Kho. - Conducted visit to some Garhwali villages & Garhwali Folk songs and dances. - Camp fires, Yoga classes and naturepathic treatment of chronic diseases, with prior appointment only. Hotel Garhwali Inn is situated at an altitude of about 4500 ft on the ridge branching off towards south- east from Lansdowne, about 3 km before of Lansdowne, 300 meter from Kotdwara-Lansdowne road, on Rihknikhal road leading to Holy Shrine of Tarkeshwar Mahadev. The rooms of the Hotel Garhwali Inn have elegent and stylist decor with classy furniture and all modern facilities is provided for your luxury and comforts. The room also offers long baths with hot & cold Water. There are total 9 rooms in different categories in the hotel. - Check out time : 12 noon.check out after 12 pm to 6 pm is chargeable by half day. - Special discounts for group & regular clients available on request. By Road: One can reach Deriakhal from Delhi by road, Deriakhal is connected by all weather road from Kotdwara, rail head for this part of Garhwal. Excellent road from Delhi to Kotdwara along NH 119 takes about 6 hrs drive from Anand Vihar ISBT to Deriakhal. There is another good option along new 4 lane highway to Dehradun up to Khatauli (bifurcation) and on to Mirapur and thereafter follow NH 119. 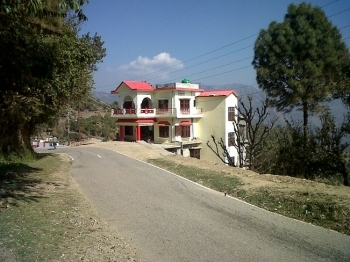 Stage 4: The Garhwali Inn 4 Kms Before Lansdowne ( Deriyakhal) Near BLUE PINE Resort. By Train: One can also come by train from Delhi Jn to Kotdwara by Mussoorie Exp (Dep 1030pm) overnight journey or Garhwal Express (Dep 7 AM ) or by air to Jollygrant and take a taxi to Deriakhal, about 2 1/2 hr drive. The nearest railhead to Lansdowne is Kotdwar situated at a distance 40 kms. Kotdwar is well connected by railway networks with major cities of India. Taxis and buses are easily available from Kotdwar to Lansdowne. By Air: Jolly Grant Airport is the nearest Airport to Lansdowne situated at a distance of 148kms. Jolly Grant Airport is well connected to Delhi with daily flights. Lansdowne is well connected by motorable roads with Jolly Grant Airport. Taxis are available from Jolly Grant Airport to Lansdowne.